Capture the special moment and convert it into a masterpiece oil painting which will last forever. Do you want to realize this? 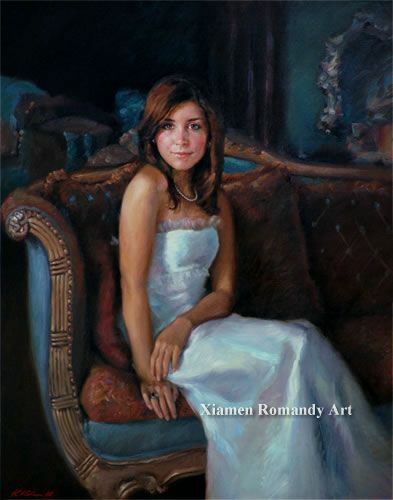 Xiamen Romandy Art can help you! Our artists have over thirty years of painting experience. They will carefully and professionally create the portrait painting according to your photo. We always use the finest materials, which will make your oil painting look better and last longer. Hand-painted portrait oil painting is a timeless gift with memories and love. So, it could be a perfect gift for your girlfriend, children, family, wedding ceremony, birthday, graduation ceremony and so on. Utilizing a photograph that you provide, we can capture your bride's glow, your daughter's smile, your grandfather's eyes, etc. and express them perfectly in the painting for you. We can make the portrait paintings with museum quality according to your photos. In order to supply museum quality paintings to our clients, our company has signed contracts with about forty famous painters from the China Painting and Calligraphy Academy. And, we have been responsible for promoting their works at home and abroad. Their paintings are of museum quality standard, which have the potential to increase in value in the near future. Our promise to you is to provide our all-out effort to offer you our best service on converting your photos into high quality oil paintings. If you want to convert your photos into high quality oil paintings, please don't hesitate to contact us. Thank you.